In Airline Fare School # 1 (The Basics, part 1) you saw what an airline fare display looks like and got a peek at part of a rule for a fare. A routing for an airline fare establishes through which cities, if any, you may be booked between Point A and B to reach your destination. Unless specifically indicated otherwise it is assumed that nonstop service is permissible if a carrier provides such service in the market. In some cases, however, only nonstop service is allowed even when a carrier offers both nonstop and connecting service. More rare is that the lower fare will only be available on connections. That is usually only in cases where a carrier is matching another airline whose service is inferior, that is, with connections. The airline with nonstop service may match the price with its own connecting service but preserve a higher price for those wishing to use its nonstop flights. What you see is a kind of schematic diagram showing 3-letter codes for cities United allows you to connect in between Sacramento and Chicago. It doesn’t mean 1) you must go through all of these cities, or 2) that United offers service between every city on the diagram. It simply means that if United service exists, and a connecting flight via the named cities is available, you may book travel via that routing for this fare. Here’s the answer to the question I posed to you. Let’s imagine American Airlines is offering a dirt cheap fare of $100 between L.A. and New York. 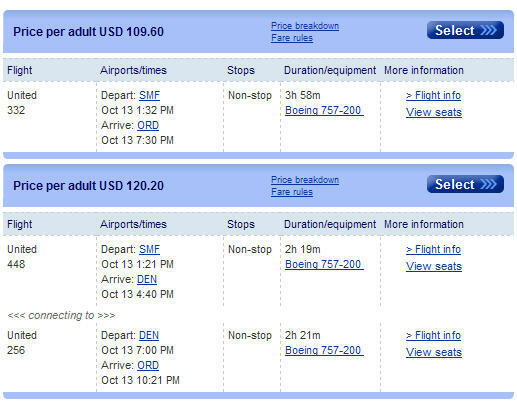 But its best fare from L.A. to Dallas (its big hub city) is $200. Some people will buy a ticket on a connecting flight from L.A. to New York via Dallas and then simply not board the flight from Dallas to New York. Assuming they have no checked luggage they’ve beaten the system and saved $100. An airline can protect itself against this practice by setting the routing for a specific fare to only apply to nonstop flights. If the routing restricts travel to nonstops then it’s impossible for any sales channel to sell the $100 fare on connections via Dallas or anywhere else. OK, back to the Sacramento-Chicago trip. The $99 fare, fare basis LA14ON8, requires booking in the L coach inventory. (More about that in AFS # 3) When I look at Sacramento-Chicago availability on United for 13 October I see an L seat available on the nonstop flight at 1:32 p.m., a connecting flight via Denver at 12:10 p.m., and a doozy of a double connection via San Francisco and Phoenix at 11:57 a.m. (arriving at 12:05 a.m. – ugh). If you look at the routing you’ll see that all three of these are permissible. In fact, in the fare’s rule it reads that up to 4 transfers are allowable for this fare. Imagine the possibilities. Why are the total prices higher for the connecting flight options? Certain fees apply that are assessed per flight segment and for use of an airport. Because the connecting flights use more airports and, of course, consist of more flight segments, these charges are higher. The underlying fare including the Federal Transportation Tax of 7.5% remains $99. We’ll take a look at the tax breakdown in the next installment of AFS about the booking of flights. Let’s conclude with another question. Can you think of a reason why someone would want to use service other than a nonstop flight even when the nonstop is available? Some people are airline junkies and they just can’t get enough of planes and airports. Right, and that accounts for about .0001% of people and most certainly does not include even me. Knowing about routings can be useful in situations where someone is trying to qualify for an elite level in an airline’s mileage program and needs to get some additional mileage without spending a lot more money. More often, people will try to find super-cheap fares (domestic or international) to somewhere, anywhere, to rack up a lot of mileage (these are called “mileage runs“) but if it’s just a small amount of additional mileage that you need to reach elite status, then knowing about routings can pay off allowing you to plan trips with as many flight segments as possible. Other reasons could possibly include wanting to travel together to a common destination with a friend who is beginning his or her trip in a different city, or connecting in a specific city just to have lunch at the airport with a friend who lives there. We’ll consider routings again later in AFS. In Airline Fare School # 3 – The Basics, part 3 we’ll look at the actual selling of the flight that ties all of this stuff about fares, rules and routings into what actually gets you into the air and on your way. Don’t miss your flight! This entry was posted in Airline Fare School and tagged airline fare routings, Airline Fare School, airline fares, routings. Bookmark the permalink. I’m sorry, I can’t figure out what table you are referring to on this page. Carlos, that’s a good question. In essence, I was providing this information based on a concept provided in the next chapter of AFS, # 3, which looks at airline availability and inventory codes. Once you read Chapter 3 I think it will make sense.